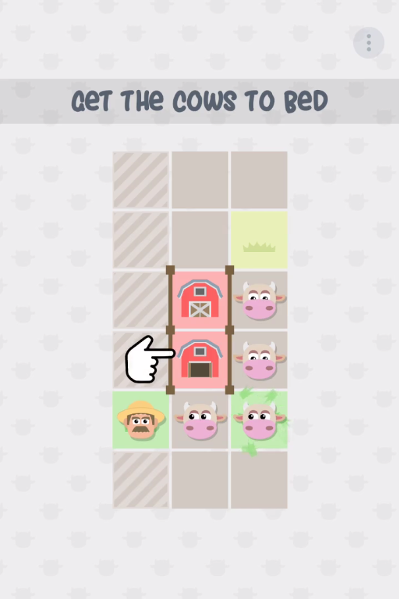 After a couple of months of hard work and head scratching coming up with levels, I’ve finished my first puzzle game and launched it for Android. 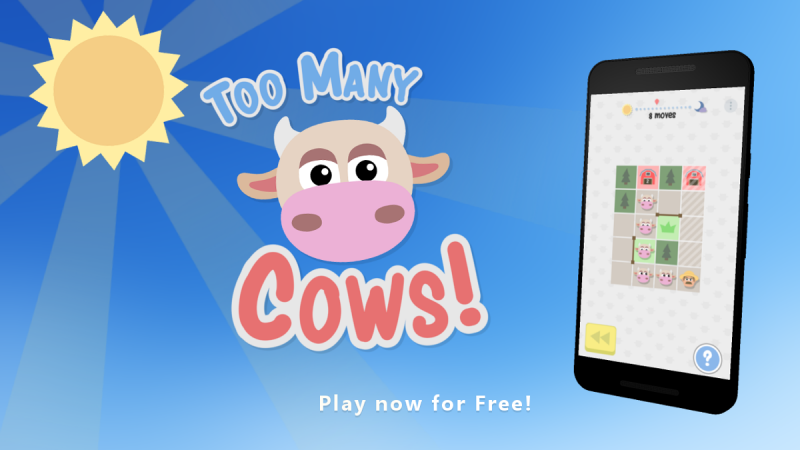 Check it out on the Google Play store! 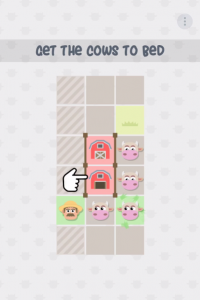 Too Many Cows is a puzzle game about getting a long line of cows fed, and then to bed. It’s a spin on the classic snake formula, where you’re not allowed to crash into yourself, but with this game there’s no need for quick reflexes. You can take as long as you want to take each move, and even rewind if you make a mistake. The challenge comes from making sure you don’t get stuck, not getting hit by a stray sheep or tractor, and getting to bed before sundown. It starts off simple, but quickly becomes surprisingly difficult. From my testing, it seems to take a good few hours to get through the (almost) 50 puzzles. 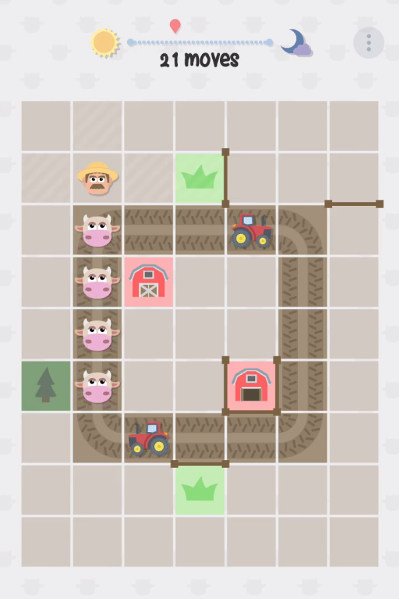 I had a great deal of fun coming up with these levels, and even more fun watching people slowly work them out while testing it in the early stages. I owe a great deal to everyone who helped me test this game. This project was my answer to whether I could make a game solo in under six months. From the first line of code to shipping took just over four months. 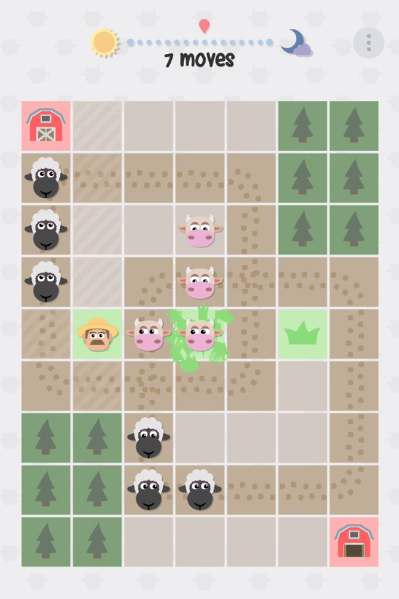 I created all the art in Blender, wrote all the code, and designed most of the puzzles (with some much needed puzzle assistance from the wonderful Oliver Thurston). Also, Incompetech was a great resource for music. The entire premise of the game is based off a GameJam entry my team and I put together last year. Originally it was a 3D game with detailed environments, but I made the decision to swap to (mostly) 2D in order to make it achievable by myself. The cutting of the scope also focused a lot of the design, making each of the elements of the game more distinctive and unique. It’s also a much better fit for mobile. My next game is definitely going to try and keep this lean approach to design.